I just had the best birria of my life. This is not an understatement. It is a claim I make as a shameless momma’s boy whose mom cooked birria once a week—and as the lucky boyfriend of a cooking school graduate who was born and raised in Jalisco, the birthplace of this spicy goat stew, where I visit and eat at least once a year. This particular birria’s broth was as complex as a bowl of ramen or pho—maybe even more so. The dry heat of the toasted red chiles and the luxuriousness of the bone broth were perfectly balanced. The birria was bursting with fiery umami without being salty. The goat—locally raised, slaughtered within the past 24 hours, simmered overnight—dissolved under the weight of my teeth. The three accompanying salsas–one red, one green, and one burgundy and made with toasted peanuts—were thick, zesty, and fresh-tasting. The tortillas were hand-made, hearty, and deeply satisfying. Everything about this birria is legendary. Remember the sweltering afternoon when that plastic clamshell container filled with ice-cold tropical fruit held you over until dinner. The street vending experience is vital to the Los Angeles way of life. Yet if I tell you where to find this particular bowl of street-sourced Mexican goat euphoria, the hardworking, genius cook could face up to a $1,000 fine or even six months in jail. So as much as it pains me—a food writer who lives to eat and who gets paid to find the most delicious spots in Los Angeles—I’ve got to keep it to myself. Think back to all those nights when a sizzling, bacon-wrapped hot dog hit the spot and sobered you up for the drive back home. Remember the sweltering afternoon when that plastic clamshell container filled with ice-cold tropical fruit held you over until dinner. The street vending experience is vital to the Los Angeles way of life. Each day there are hundreds of vendors out in almost every part of this county, from Pacoima to Watts. Yet the city of Los Angeles keeps in place a zero-tolerance policy: Any kind of vending on city streets is illegal and punishable by law, according to city ordinance 42.00(b). Consequences range from confiscation of cooking gear and ingredients to jail time and even deportation. Street vending in Los Angeles was first banned in the mid-1930s, but only in downtown and then in other major business districts. In 1974, the City Council voted to ban sidewalk vending throughout the city, with the goal of protecting brick-and-mortar merchants and the public health. During the economic downturn of the 1990s, the City Council lifted the ban and allowed vendors to work legally in MacArthur Park, but they were shut down in 2006. Currently, street vendors can obtain a Los Angeles County Health Code certification and business tax license. However, this paperwork doesn’t mean anything, since vendors are still penalized for violating city laws in Los Angeles and elsewhere; cities throughout the county have similar bans in place. It’s curious, at best, that this street food criminalization has persisted in a time when Angelenos are obsessed with finding the best al pastor taco and will stop at nothing until they eat it, Instagram it, then Yelp about it. Food writers, too, are stepping out of covering Silver Lake and downtown’s press-release-email-blast-driven food scene and trekking east and south with their Nikons and Canons to places like Lincoln Heights and Compton, where street food has always been abundant and affordable. This journalistic work naturally entails publishing street vendors’ addresses and hours of operation—and giving them an online presence for the very first time. The good: more business from outsider foodies who want a taste of authenticity. The bad: getting on the radar of the health department and the local police precinct, and probably annoying the neighbors, since all those new customers have to park somewhere. Even worse: the additional attention increases the odds of the street vendor getting shut down—which is the last thing I’m looking to do to my favorite birria cook. Growing up right off Whittier Boulevard in East Los Angeles, I saw a number of street vendors get arrested, a process that at times involved tears, piles of perfectly good food ending up in trash cans, and handcuffed fathers in the backseat of police cars. Which is why from the time I started writing about food professionally I vowed not to publish any street vendor’s location or any other content that might jeopardize the way they get by. No matter how amazing and regional the food may be—or how much praise I may receive for being the first to write about it. The short burst of glory that comes from an online write-up—which can include appearances on Spanish-language morning shows—has serious consequences that neither the writer nor the vendor can anticipate. I call the quandary of writing about a technically illegal operation the “Breed Street Effect,” after the bustling nightly street vending festival that thrived in Boyle Heights for 15 years. Breed Street’s 2009 demise was ultimately brought forth by a combination of factors, from the personal grudges of local authorities to neighborhood restaurants filing complaints. But the tipping point for closing the market may have been an entire message board thread dedicated to the unofficial street food fair on the Chowhound website. One post—written by someone who undoubtedly thought she was being generous to foodies and vendors alike—opened the floodgates for bloggers with big cameras and dining meet-up groups to flock there. Those who are opposed to legalizing vending say it will be difficult to regulate. However, that’s hard to believe when you look at certified farmers markets and regulated food trucks, two hugely successful institutions. And do we want to think that our city is not as progressive as Chicago and New York, which both have systems of successful street food regulation? 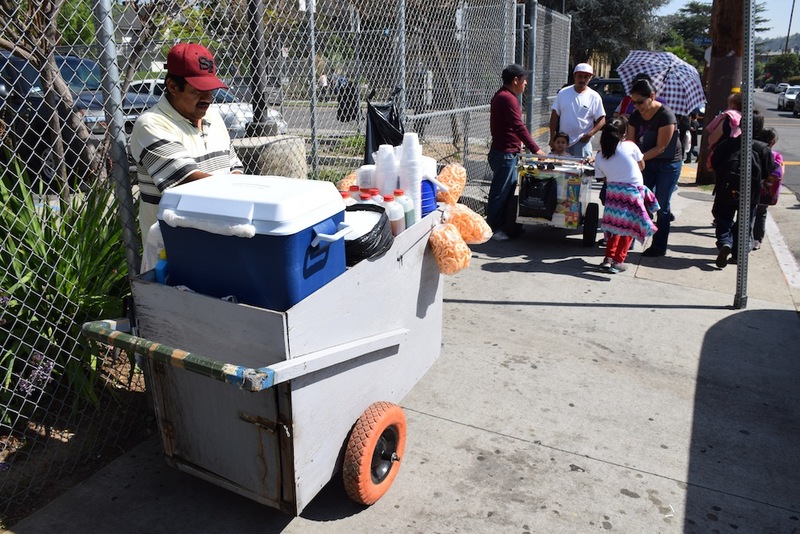 ELACC has done a survey showing that another point of contention—that street vendors take business away from bricks-and-mortar establishments—is a myth. If numbers are what you need, a study last year by Economic Roundtable showed that street vendors create 5,234 jobs in Los Angeles County, and for every $2 they earn, an additional $1.72 in economic activity is generated. If taxed, street vendors would ultimately add $43 million to state and local tax revenues. It’s a shame for your stomach, too, because I won’t tell you where you can find fresh, unpasteurized pulque (a fermented Mexican beverage that tastes like lactic, full-bodied coconut water) made from locally grown agave. And I’m not going to describe the woman who sells blue corn quesadillas with tortillas made completely by hand, directly on the grill. And I’m definitely not going to tell anyone where they can find that bowl of birria. Javier Cabral is an East Los Angeles native and food culture reporter. While he won’t tell you where to find this particular bowl of perfect birria, he’ll tell you where to find other really tasty stuff around town. Follow him on Instagram and Twitter @theglutster. California politics, community, Food, Thinking L.A.